Yesterday, four days after a small riot took place at the Nevada State Democratic Convention over what Bernie Sanders' supporters say were rule changes depriving Bernie of FOUR DELEGATES and a win that was never going to happen because he had already lost Nevada in FEBRUARY, Bernie Sanders issued a statement warning the Democratic Party that there's a new sheriff in town and they've been really, really bad so whatever happens, it's on them, not him. Considering that Roberta Lange, the hapless state party chairwoman who got herself into a bit of a mess over party rules, was being bombarded with harassing phone calls at all hours of the day and night, not to mention DEATH THREATS, some of us thought maybe Bernie would call for his people to just calm down. Don't go there. I'm telling you. But, no, Bernie instead took it as an opportunity to blast the Democrats for not listening to him when he told them there was a revolution going on. What did they expect would happen? It's a revolution, dammit! R.E.V.O.L.U.T.I.O.N!! Now, okay, the Democratic Party--my party, if I haven't told you often enough--is in bad need of a shake-up. I'll be the first (okay, maybe not the first) to admit that. We strayed away from many of the foundations FDR built for us more than three quarters of a century ago, and, in the process, allowed the Republicans to ride rough-shod over the entire country. We didn't fight hard enough against them, which means we didn't fight hard enough for the people who counted on us. We thought we could work with those guys--constitution, common good, our country tis of thee, something, something--even though ever since Eisenhower they've made it clear they would just as soon grind us into guano as look at us. But here's the thing about us Democrats. We're still better than they are. Way better. 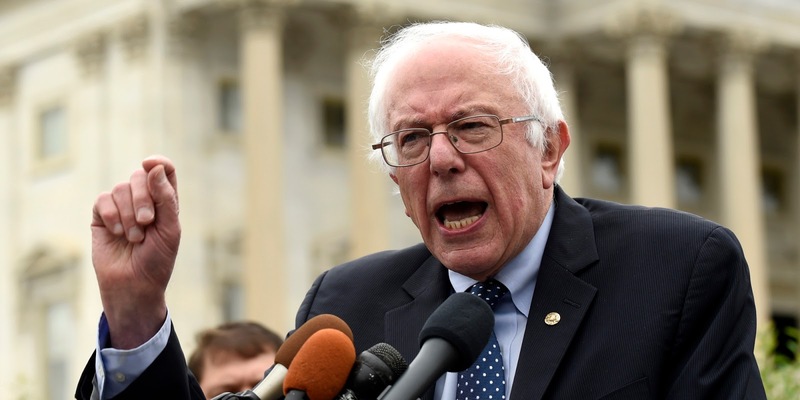 So much better, Bernie Sanders, the Independent Democratic Socialist Revolutionary, didn't feel the least bit ashamed about joining up with us in his quest to become the One and Only Democratic Party presidential candidate. Bernie, as much as he would now like to disclaim any affiliation with us, or even affection for us, made the first move. HE joined US. He has a message and it's a good one: Let's do all we can to help people who are hurting, either because of governmental policies now in place, or because of a lack of protective governmental policies. Who couldn't get behind that? I myself applauded him for getting the message out loud and clear. We, the Democrats, haven't done a good enough job. Now we're in a position to change that, and Bernie wants to help us. Yay! That was when the Democrats were still "we". Now we've become "they". The accusations are flying; neither side wants to admit any wrongdoing. Looks like we're heading for a divorce. It could get ugly. But wait! Is that reconciliation I see around the corner? Bernie Sanders' go-to guy, Jeff Weaver, just said on national TV that no matter how much it looks like Sanders is trashing the Democrats, calling them corrupt dishonest establishment whores bought and paid for by Wall Street, and, even worse, "low energy", of course he'll do what he can to keep Donald Trump out of the White House. Of course. Because if Bernie Sanders is anything, he's a uniter, not a divider. And if the Democrats don't agree, well, screw 'em.